IBM Sees A Big Boost As It Turns 100 Far from a relic, IBM has been one of the best stocks on the Dow this year, rising more than perennial tech hotshots Google and Apple. A revamp of its business to focus on services and software so impressed Warren Buffet, he bought $10.7 billion worth of IBM stock. 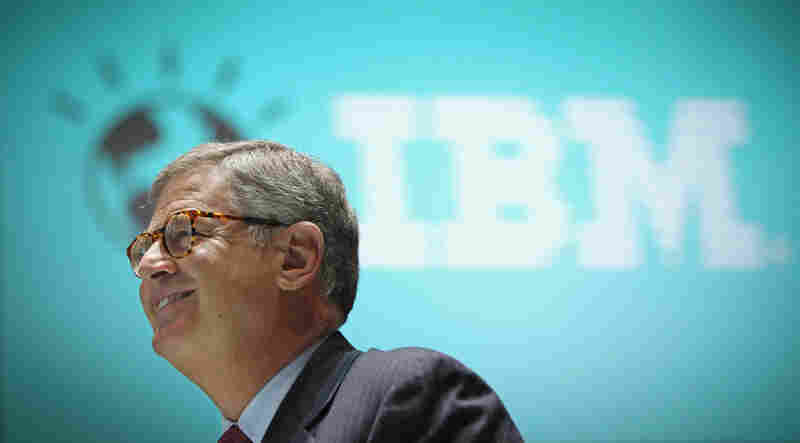 Reason To Smile: Samuel Palmisano, president and CEO of IBM, walks by an IBM logo at the CeBIT technology fair in Hanover, Germany. Palmisano is set to step down later this month, and Virginia Rometty will take over on Jan. 1. Far from a relic, IBM has been one of the best stocks on the Dow this year, rising more than perennial tech hotshots Google and Apple. The company may be 100, but it has totally remade its business for the 21st century. Your Turn: What's It Been A Good Year For? The company sold its PC business 6 years ago, and now, more than 83 percent of its business is services and software. Sign a contract with Big Blue and you get consulting, cloud computing, servers, analytics, even financing. "There is no such thing as an IBM PC," says IBM managing partner Adam Klaber. The revamp impressed Warren Buffet so much he recently announced he'd bought $10.7 billion worth of IBM stock. IBM has become the one-stop-shop of choice for many governments and companies. When the NYPD needed a system to track crime and better deploy cops, they hired IBM. When the telecom company Bharti Airtel wanted to build wireless coverage in 16 African countries, it went with IBM. It's also been aggressively building up its presence in the fastest growing countries — China, Brazil, and India — where it says it'll get 30 percent of its revenue in four years. In China alone, IBM has deployed 20,000 consultants.